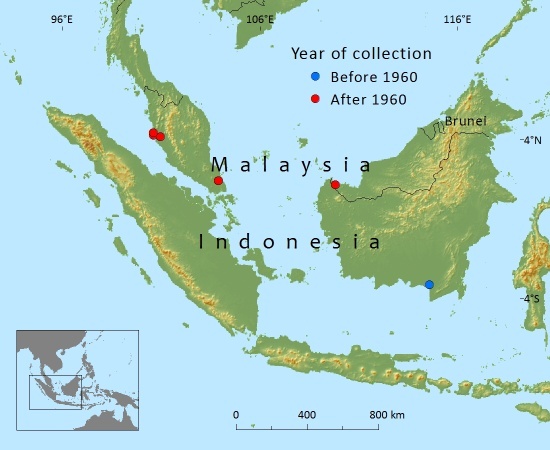 A relatively widespread species recorded from southern Thailand, Peninsular Malaysia, Sarawak, Sabah, Brunei, Sumatera and Kalimantan (not all locations are mapped). A tall, straight boled tree found in tropical lowland forest, usually on dry soils but also recorded from peat swamps in Peninsular Malaysia (Jusoff, 2007) and Sarawak (Farjon, 2010). Like many other tropical Podocarps it produces a valuable timber that is used construction, plywood, veneer and furniture. Nageia motleyi has a relatively wide distribution from southern Thailand, throughout most of Malaysia, southeast Kalimantan and Sumatera. The extent of occurrence is in excess of 20,000km². The area of occupancy is uncertain due to insufficient data from within its range. However, overlaying regional maps of deforestation indicates that there has been a substantial rangewide reduction in primary and secondary forests due to clearcutting and conversion of forest for agriculture and monocropping. A conservative estimate for this reduction would be between 30 and 50% within the last three generations (one generation is assumed to be at least 10 years). On this basis an assessment of Vulnerable under the criteria for A2c is warranted. As this species is predominantly found in lowland tropical rainforest, its area of occupancy has been substantially reduced over the last three decades due to logging and the conversion of forest to agriculture, especially palm oil production. In many areas at least 50% of the tropical rainforest has been converted and this trend is continuing. This species has been recorded from a few protected areas. Curran, L.M., Trigg, S.N., McDonald, A.K., Astiani, D., Hardiono, Y.M., Siregar, P., Caniago, I. and Kasischke, E. (2004). Lowland Forest Loss in Protected Areas of Indonesian Borneo. Science 303(5660): 1000 - 1003. Jusoff, K., C.H. Hassan & Hamzah, K.A. (2007). Tropical peat swamp forest ecosystem and floristic diversity in Pahang, Malaysia. Journal of Systems Applications, Engineering and Development 3(1): 41-44. 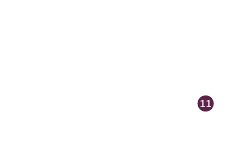 Laumonier, Y., Uryu, Y., Stuwe, M., Budiman. A., Setiabudi, B. & Hadian, O. (2010). Eco-floristic sectors and deforestation threats in Sumatra: identifying new conservation area network priorities for ecosystem-based land use planning. Biodiversity and Conservation 19: 1153-1174. Thomas, P. 2013. Nageia motleyi. The IUCN Red List of Threatened Species. Version 2015.2. <www.iucnredlist.org>. Downloaded on 07 September 2015. UNEP. (2007). Extent of deforestation in Borneo 1950-2005, and projection towards 2020. Available at: http://maps.grida.no/go/graphic/extent-of-deforestation-in-borneo-1950-2005-and-projection-towards-2020. . (Accessed: 20 February 2012). UNEP/GRID. (2002). Disappearing forests (Thailand). Available at: http://maps.grida.no/go/graphic/disappearing-forests . (Accessed: February 20, 2012). Uryu, Y., Purastuti, E., Laumonier, Y., Sunarto, Setiabudi, Budiman, A., Yulianto, K., Sudibyo, A., Hadian, O., Kosasih, D.A. and Stüwe, M. (2010). Sumatra’s Forests, Their Wildlife and the Climate. Windows in Time: 1985, 1990, 2000 and 2009. A quantitative assessment of some of Sumatra’s natural resources submitted as technical report by invitation to the National Forestry Council (DKN) of Indonesia. WWF Indonesia, Jakarta. Wetlands International. (2010). A quick scan of peatlands in Malaysia. Wetlands International, Petaling Jaya, Malaysia. P.Thomas, 2015. Nageia motleyi, from the website, Threatened Conifers of The World (http://threatenedconifers.rbge.org.uk/taxa/details/872).